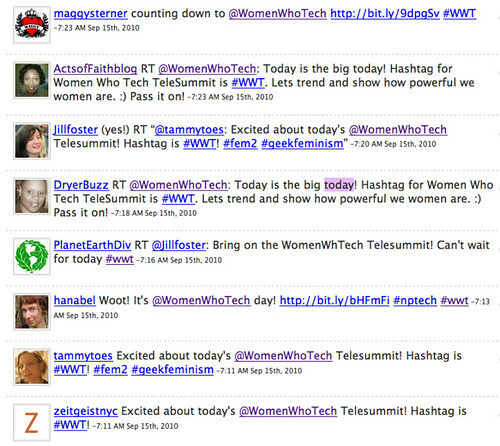 The speaker list for today’s sold-out Women Who Tech TeleSummit is amazing, amazing, amazing … @jillfoster, @digitalsista, @blogdiva, @missrogue, @randomdeanna, @conniereece along with TeleSummit organizer Allyson Kapin of Rad Campaigns (aka @WomenWhoTech), and that’s just the first hour! 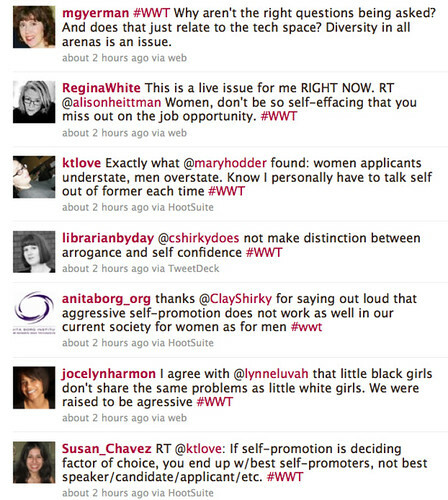 The timing’s perfect, hot on the heels of the kerfuffle sparked by @ShiraOvide’s Wall Street Journal article Addressing the Lack of Women Running Tech Startups and TechCrunch founder @arrington’s rant Too Few Women In Tech? Stop Blaming The Men. Or at least stop blaming me. Drama aside, the results were really positive: a panel on “women’s issues” added to TechCrunch Disrupt, a ton of attention to the issue, highlighting a lot of talented women innovators. So while on the one hand it’s a tempest in a teapot, it’s also a real #diversitywin (as we like to say on Twitter). As @cathybrooks (who will be on the Female Ferocity panel along with TechCrunch CEO @heatherharde) says in Moving Forward, Seizing the future, women aren’t just complaining; we’re doing something about it. And then the following week, after @ChiaraAtik’s article in Guest of a Guest discussed TechStars overwhelmingly male mentor pool in New York, @davetisch immediately reached out to try to include more women. ** Good outcome, and remarkably drama free! So I’m noticing a pattern here — a positive one, for a change. 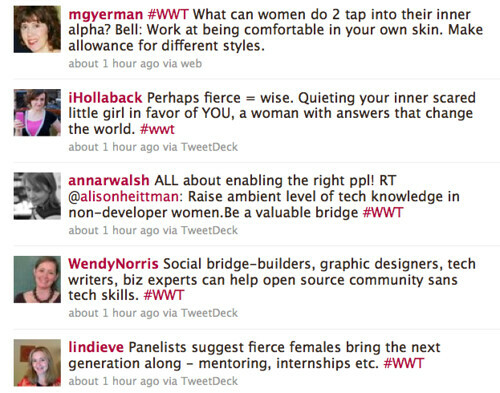 The panel discussions and slide decks at the Women Who Tech TeleSummit give a chance to go into more detail than you can fit into 14o characters, and the in-person after parties provide chances for deeper connections. So as well as increasing visibility, it’s a great chance to build on the successes, share information, ask and answer questions and plan what’s next. ** speaking of which: TechStars Seattle mentor pool is overwhelmingly male too, and it’d be great to do something about that. originally published on September 13. updated on September 15. Posted by jon on Wednesday, September 15th, 2010, at 6:15 am, and filed under Uncategorized. Thanks for all the support Jon. You rawk! Aw blush. Thanks Allyson. My pleasure! Allyson kicked it off by noting that it’s been a pretty big year for women in tech, pointing to the media coverage, progress in conference representation, and the rock star women out there. Yeah really. Here are couple highlights from the first session, with Allyson and Jill Foster, which was truly excellent! Jill told me they’re going to follow up with a blog post. Cool! Update, September 19: here’s Jill’s post, 9 tips tips tips on public speaking mojo, on live your talk. Shireen and Liza gave an amazing talk on innovation. Their theme was on “Open Diversity”: the perspective of diversity as opening us up to opportunities rather than (as so many phrase it) something that requires sacrificing quality. So many things they said were music to my ears, with focus on often-overlooked aspects of diversity like multilinguals and accessibility. 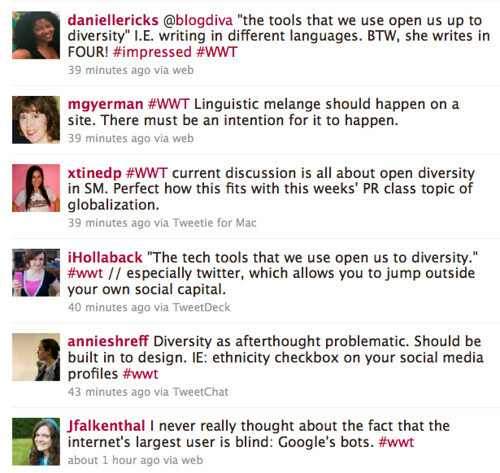 I really liked the brilliant framing that “the tools we use should open us to diversity”. And when Liza was talking about how designing for accessibility can have benefits like leading to better design for the mobile experience, I flashed on my friend Madelyn Bryant McIntyre (who at the time was running accessibility at Microsoft) pointing out to me that the accessibility hooks you needed to put in software also enable efficient automated testing. Indeed. It was a another great panel, moderated by Geoff Livingston, with Amra Tareen and Rashmi Sinha. Geoff took a lot of audience questions, which was great. Very thought-provoking discussions on risk, the all-important challenge of getting your first 10, 50, 100 customers, the role of IP, and so much more. At the same time, there was also a great activism panel on energizing your base, including discussion new geolocation technologies. Good stuff! Moderator @amyrsward’s Tools and Apps to Energize your Base, on Amy Sample Ward’s Version of NPTech, is a great recap with tons of valuable resources. Tons of great stuff too in building the ultimate user experience, including great slides and a tutorial on how to build a good UX that was short enough to be tweeted: grab one of your users, sit ’em down with the thing you’re working on, make sure they care, watch what they do, shut up, listen, take notes. There was a lot of talk about emotion and connections, and tons of great references. Some of the ideas that came up on the making of the ultimate user experience: social dynamics, game dynamics, smartphones and ipads, and the rise of the app. The moderator took a question from me whether any of them knew any commercial or open-source projects trying to apply insights from Gender HCI, the recent and relatively-unknown field of applying a gender lens to human-Computer Interaction. Apparently not. So there may well be some academic work there that hasn’t yet been leveraged. If you’re working on a startup or a new user interface for an existing product, sounds like a huge opportunity to me! The panel on Social Media Return on Investment seemed like it was fantastic as well. Beth Kanter has slides and resources. All the speakers agreed that people who are more assertive do get more attention, and there were some good pragmatic tips here. But what about the other aspects, the “filters” that people put in place when hiring or looking for conference speakers (as described in Mary Hodder’s Rant on Aggression is Our Filter (For Now)) and structural barriers to women? At least for me, it’s striking how little Clay’s thinking has evolved after the responses to his rant (including Deanna Zandt’s). Very interesting, and a great opportunity to for discussion! Of course that was only one of the topics of the panel. Some other highlights: Lynne d Johnson going into details about how SXSW has increased their diversity (and how it’s benefited them) and the additional challenges faced by women of color and black techpreneurs. Mary Hodder gave the perspectives of a hiring manager — and somebody who did a definitive guest post for TechCrunch, but still wasn’t invited to speak because she wasn’t viewed as a rockstar. Clay talked about the NYU faculty doing an intervention in a class that had become hostile to women. And Kevin made great points about the value of a “culture not ruled by self-aggrandizing jerks — they go for the short win and don’t last.” And there were also lots of pragmatic tips from the panelists … good stuff. 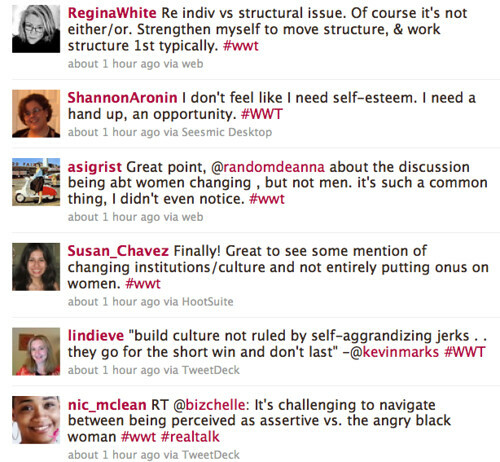 Here’s Excerpts from the excellent Twitter discussion. Wow, Jon, thanks for the excellent summary. Can’t believe you managed to listen in, participate in the back channel AND take notes at the same time. Kudos! See you next year! Sarah Mei’s discussion on the Women, Open Source and Open Standards panel continued the theme of representation with some great suggestions of how event organizers can change the ratio based on her experiences with the SF Ruby community, which has gone from 2% women to 18% at its events. Hmm, maybe it’s not primarily a problem about women’s lack of aggressiveness. Yeah really. See @lynneluvah and others points in the previous comment. Nonetheless the female ferocity panel had lots of good stuff too. One of the highlights was @ElisaC’s observation that we’ll have reached parity when women are seen as individual jerks, not as exemplars of “all women.” There were also very practical recommendations like taking acting lessons and experimenting with improv comedy. Great ideas! When I was at Microsoft, the Ad Astra project I led brought in improv comic/innovation consultant John Sweeney to lead innovation workshops at the speed of laughter, and the exercises we did at the beginning noticeably increased people’s confidence in speaking up in a hostile environment. ** Here’s Sarah’s perspective from 2007 — still relevant. In retrospect, I fell prey to jargon when I asked the incomprehensible “Gender HCI” question I discussed above. Oops. Good lesson for me. 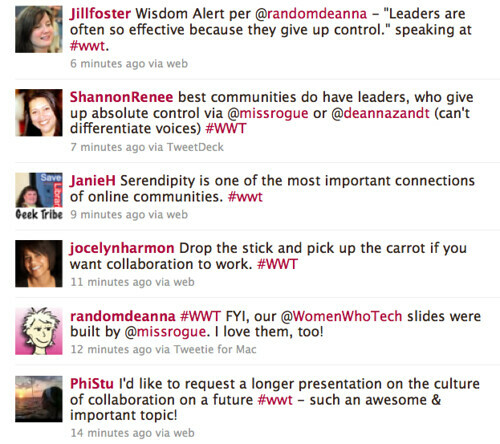 Wthashtag is also the best place to go for a full transcript of the Twitter feed. Enjoy! Wow Jon. What a fantastic recap! Thanks for this recap and the tweets … wasn’t able to track during the session. I did want to comment about one of the tweets above that mentions the fact that the Female Ferocity panel didn’t have any women of color on it. 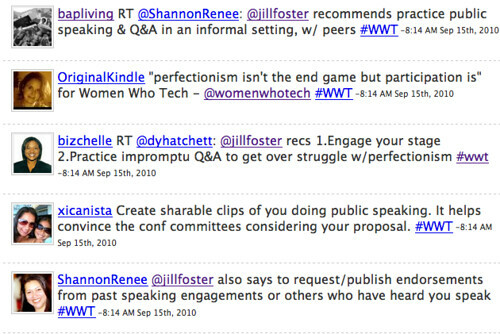 I had asked a couple of folks, but none were available and some of the others I’d thought about I understood to already be slated for other sessions … I will admit that I probably could and should have dug a bit deeper to have even more diversity among the females on that panel … but for what it’s worth when the topic was raised in the chat room I specifically asked the questioner if she had specific comments/input to share on the topic, but short of asking me if there were WOC in the group she didn’t proffer additional thoughts. I do think the topic merits more discussion though – about how women who carry a second “minority” status address being fierce. From where I sit as a Jewish lesbian, I totally get that having a double or triple whammy on the minority front ain’t easy. Wow! Thanks so much for putting this summary together. 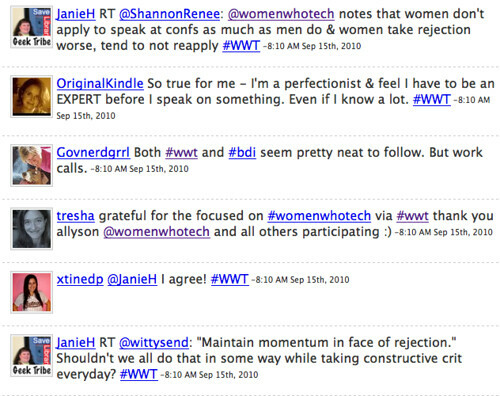 I wanted so much to be a part of Women Who Tech, but the scheduling didn’t work for me. I’m glad you took the time to put this article together, so I can get a glimpse of what I missed!!! Thanks again! Thanks, Allyson, Cathy, and Monica — and belated thanks to Shellie above! 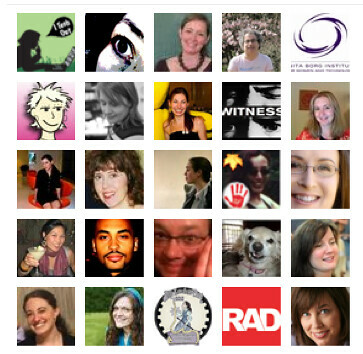 Cathy, I was having a hard time tracking the chat rooms and Twitter so apologies if I missed some of the conversation. With multiple channels going on it’s hard to keep up. One approach that works well in situations like this is to invite somebody onto the panel last-minute to provide some of the perspectives that aren’t being represented. Also no matter what the composition of the panel, the Twitter stream is a great source of diversity; having people on the panel engage with it and bring in highlights can make a big difference — Cognitive Evolution and Revolution has an example from Politics 09. I’m sure “fierceness” has different resonances in black, Latin@, Asian American, rural, older, bilingual, and many other perspectives. Interacting with Twitter backchannel enables all of them. And totally agreed on the additional challenges for women as other axes of oppression come into play. Wow, great party! Did anybody take pics? It was very much an embodiment of one of @missrogue and @randomdeanna’s points above. I always worry about showing up and not knowing anybody there and sure enough that’s what happened. Fortunately everybody was friendly, @lindieve and @slickiris were very welcoming hosts and there was a natural conversation topic to break the ice. Thanks to NextSpace for hosting, and to the other sponsors for the wonderful food. 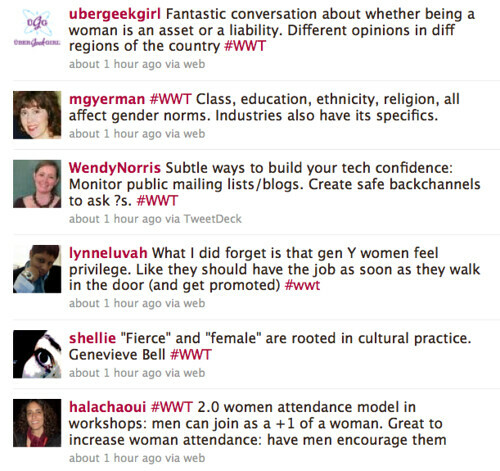 I wound up attaching myself to a conversation between Raissa of @thriftygourmet (who’s just been accepted to a @women2 incubator), @kevinmarks, and Gina. After which I continued to meet some amazing people, including some like @skud, @sarahdopp, and @adriarichards who I’ve idolized online for a long time, and got some behind-the-scenes Women Who Tech scoop from Eve. I reconnected with @ch3ryl (whose colleague @rozlemieux had moderated the awesome Social media ROI panel), @bklem, @rosiecal, @identitywoman, and doing some great networking with @wordydoddles of Moms Rising. Rose’s friend @zacwitte had checked out diaspora and we listened eagerly to his experiences. Plus it was a total “when worlds collide” moment when Nicky and Tamar from @dotRights showed up. It was great to see them talking with Cheryl and Anita. Social network activism as the future of civil liberties, indeed. We should totally do one of these in Seattle next year! go for it! 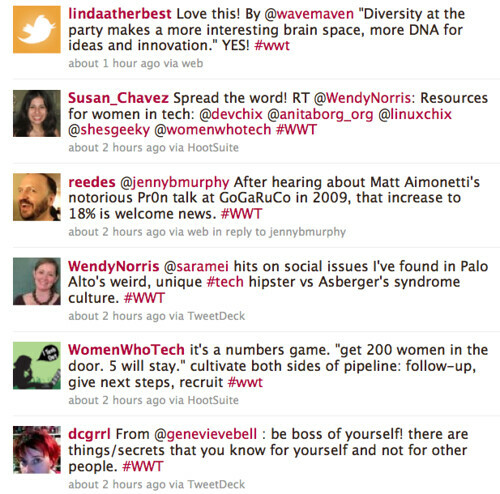 Find other people are interested, reach out on Twitter and connect with people because it is worth it. Well said on all fronts! Totally agree with Allyson’s comment (#1)! Jon, it was great meeting you too! You are quite the observer– it was indeed fabulous to connect with the ACLU women, Denise of NLC and others. Nice link to Pam’s House Blend too, btw! Thanks Susan! And Anita Sarah, glad you liked the link, and I was very glad to see you talking to the ACLU women! A couple more followups to go with the ones from dcgrrl, Adria and Jill I mentioned earlier in the thread…. 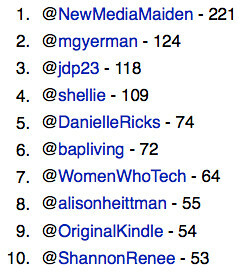 Shellie’s I typed #WWT 109 times over the course of 7 hours on Tongue. Cheek. Ouch, Shellie sketches a few of her takeaways: engage your own stage; diversity is an opportunity for innovation; most risks don’t end up in dismemberment, death or imprisonment; and a top-down directive is not a quota. The pipeline discussion, along with Heather Harde’s comment — The best motivation and reinforcement you can get is leadership opportunities at a young age – made me think of the mantra “Each One Teach One, Each One Reach One.” Can you encourage a girl to stick with science or math club, so that her confidence in her own special talents doesn’t wane as she hits middle school? Can you convince a teenager that basketball or another sport will teach her how to be a leader, and how to work with a team toward a common goal? Can you reach out to a girl and get her involved in an activity that will help her build leadership skills, such as Girl Scouts? And, then, if you want to help that Girl Scout become a tech pioneer in an even more concrete way, respond to this challenge from Brittany Laughlin — a young woman tech pioneer herself. Sue Ann Reed’s got some Key Takeaways as well, include three I completely agree with: women need to stop trying to be perfect, put your work out there, and metrics are important, but they need to be the right metrics. There’s also one I’d phrase somewhat differently. 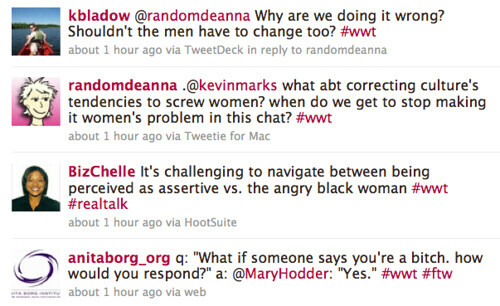 Sue’s phrasing echoes something Mary Hodder said on a panel: “men are not to blame for more women not being involved in tech conferences, but conference organizers are to blame for not looking for more diversity.” On the one hand I totally agree that it’s not useful to blame men, and that it’s a general problem. 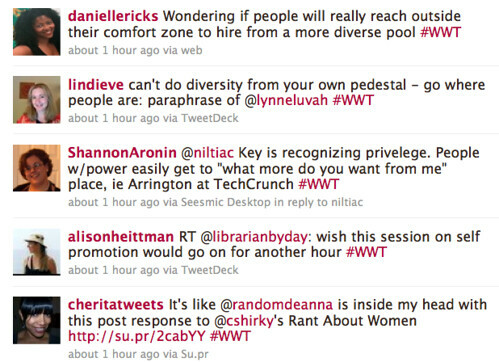 Conference organizers of all genders should be doing more to increase diversity in multiple dimensions; SXSW, SF Ruby, and many other role models show how. And quite frankly I see a lot more women than men doing these things. So while I certainly don’t see it as a matter of “blame”, I wouldn’t let the guys off the hook that quickly. In the aggregate, there’s a lot more we could do. « Emoware: What does “emotional software” feel like?